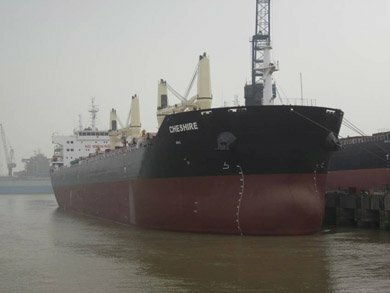 Crew were evacuated yesterday off a fire-ridden bulk carrier carrying fertilizer off the Canary Islands. The fire was first reported on Sunday onboard the UK-flagged Cheshire , owned by Bibby Line, but the ship was denied entry to Las Palmas. Yesterday morning the ship suffered a series of explosions and two Spanish search and rescue helicopters were deployed to take the 24 crew off the burning vessel. The ship is now 80 nautical miles south the Canaries and it remains unclear whether the ship will be scuttled or will find a port willing to take it in. Am hearing rumours the cargo is ammonium nitrate…? A cargo that one has to be careful of for sure – after all didn’t the IRA use it back in the day…? The cargo is in fact an ammonium nitrate based fertilizer of a non-hazardous kind.